Valentino Rossi starts his fourth campaign as a Yamaha Factory Team rider in 2007 with the clear target of recapturing the MotoGP World Championship title after being dethroned by Nicky Hayden last year. After winning two consecutive World Championships with Yamaha in 2004 and 2005, following on from three previous back-to-back title successes, Rossi finished runner-up to the American despite scoring ten podiums and winning five races - more than any other rider. Now the record-breaking Italian, widely regarded as the finest motorcycle racer of his generation, starts the season without the crown to defend for the first time in five years. 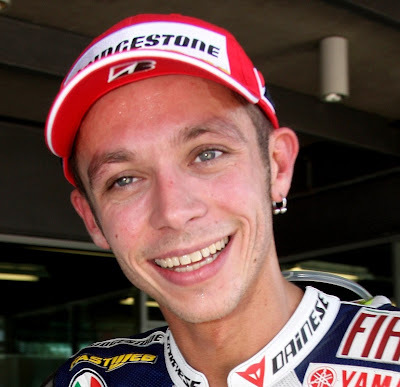 Rossi’s five wins in 2006 took his premier-class career tally to 58, leaving him within striking distance of the legendary Giacomo Agostini’s all-time record of 68 – another enticing target for the 2007 season. For the third consecutive campaign Valentino will be ably assisted by his trusted team-mate and great friend Colin Edwards, as the pair apply their highly effective development partnership to Yamaha’s all-new 800cc machine and attempt to regain the Manufacturers’ and Teams’ titles they won together in 2005. Rossi’s World Championship debut came at the Malaysian Grand Prix in 1996 and he finished his first international season in 9th place with one race win. The following year he became the youngest ever rider to win the 125cc World Championship, winning eleven races along the way with Aprilia. The pattern continued when he moved into the 250cc class, taking second place in his first year before becoming World Champion in 1999, once again with Aprilia. In 2000 he entered a new phase of his career when he joined forces with Honda in the 500cc class. He proved his worth once again by finishing second, before becoming the last ever 500cc World Champion in 2001. 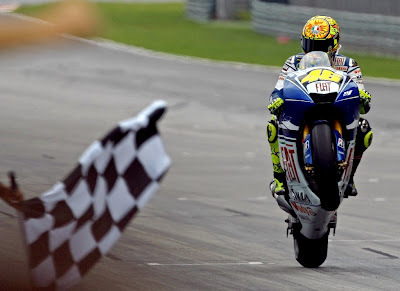 Rossi held onto his crown four the next four consecutive seasons, taking the MotoGP World title in 2002 and 2003, before moving to Yamaha and winning again in 2004 and 2005. Rossi made history by moving to Yamaha in 2004 and winning the season-opening Grand Prix in South Africa, becoming the first rider in the history of the sport to win back-to-back premier class races for different manufacturers. He went on to win nine out of 16 races, finally clinching the World Championship title, Yamaha’s first for 12 years, with victory at the penultimate Grand Prix in Phillip Island. A final win at the Valencia Grand Prix also ensured that the Yamaha Factory Team won the team title. Rossi followed up that triumph with a season of unprecedented success in 2005, when he successfully defended the title once again with a total of eleven race wins and five pole positions - only finishing off the podium once.Rossi turned 28 in February 2007 and remains the youngest rider to have won World Championships in all three classes. He continues to have the support of his long-standing Crew Chief, Jeremy Burgess, who moved from Honda to work with him at Yamaha Factory Racing. One of the most popular members of the paddock, ‘The Doctor’ has a wide fan base all over the world. A keen football fan and an accomplished rally driver, he is based in London between races. Hi to all, because I am in fact eager of reading this webpage's post to be updated regularly. It carries fastidious material. I've been exploring for a little for any high-quality articles or weblog posts on this kind of area . Exploring in Yahoo I finally stumbled upon this site. Studying this information So i am happy to express that I have a very excellent uncanny feeling I discovered just what I needed. I so much definitely will make sure to do not fail to remember this web site and give it a look on a relentless basis.